Click on the PDF icon to view items available in the PDF file format. The free Adobe Acrobat Reader is needed to view the PDF files on this page. Ashley Boomer, a student working with EMFSL microbiologist Jitu Patel, has received an American Society for Microbiology (ASM) Undergraduate Research Capstone Fellowship. Ms. Boomer will present her research at the annual ASM meeting, June 7-11, 2018, in Atlanta, Georgia. Click here to see the full list of award winners at the ASM website. Ashley Boomer, a student working with EMFSL microbiologist Jitu Patel, received the first place prize in the student division for her research presented at the 29th annual Beltsville Poster Day that was held on April 25, 2018 at the ARS National Agricultural Library. Handheld Imaging Device and Method for Improving And Cleaning and Sanitation Inspection of Food Processing Environments by the EMFSL Sensing Technologies team was selected as one of the winners of the 2016 FLC Awards for Excellence in Technology Transfer. Click here to see the full list of award winners at the FLC website.The awards will be presented on April 27, 2016, at the 2016 FLC National Meeting in Chicago, Illinois. Handheld imaging and method for improving cleaning food processing environments by the EMFSL Sensing Technologies team was selected as a winner of the 2015 Federal Laboratory Consortium for Technology Transfer (FLC) Mid-Atlantic Regional Award for Excellence in Technology Transfer. Click here to see the full list of award winners for 2015 at the FLC Mid-Atlantic website. The awards will be presented at an awards luncheon on November 3 at the 2015 FLC Mid-Atlantic Regional Meeting being held jointly with the Innovation 2 Commercialization (I2C) Conference at the Universities at Shady Grove Conference Center in Rockville, Maryland. 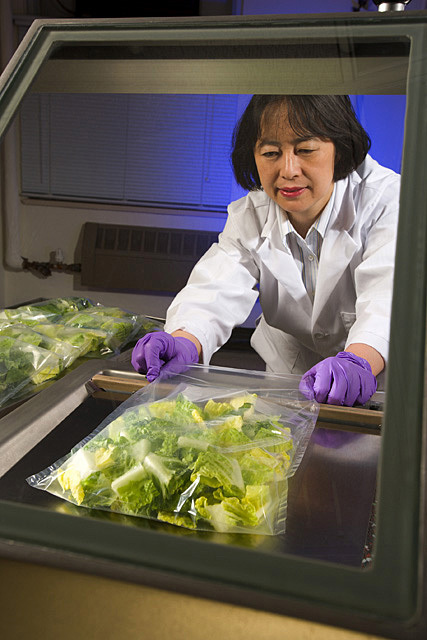 EMFSL/FQL Food Technologist Sunny Luo was among the four ARS scientists named as Senior Area Scientists of the Year for 2015. Dr. Luo was recognized for her for innovative research contributions to science-based food safety regulations and best industry practices. Read the ARS News article about all the research scientists (including Dr. Luo) honored this year. Online Imaging for Real-time Wholesomeness Inspection in Poultry Processing by the EMFSL Sensing Technologies team was selected as one of the winners of the 2015 FLC Awards for Excellence in Technology Transfer. Click here to see the full list of award winners at the FLC website.The awards were presented on April 29, 2015 at the 2015 FLC National Meeting in Denver, Colorado. Online Imaging for Real-time Wholesomeness Inspection in Poultry Processing by the EMFSL Sensing Technologies team was selected as a winner of the 2014 Federal Laboratory Consortium for Technology Transfer (FLC) Mid-Atlantic Regional Award for Excellence in Technology Transfer. Click here to see the full list of award winners for 2014 at the FLC Mid-Atlantic website.The awards were presented at the FLC Mid-Atlantic Regional Meeting at the Maritime Institute of Tech. & Graduate Studies in Linthicum Heights, Maryland. The High Tunnel Forum, a forum co-hosted by ARS, the University of Maryland Extension, and Montgomery County's Department of Economic Development, was selected as a winner of the 2014 Federal Laboratory Consortium for Technology Transfer (FLC) Mid-Atlantic Regional Award for Educational Institution and Federal Laboratory Partnership. EMFSL scientist Patricia Millner was one of the many ARS scientists involved in this collaboration. EMFSL zoologist Ron Fayer was among the three ARS scientists inducted into the ARS Science Hall of Fame this year. Dr. Fayer was recognized for his scientific research leadership on parasites that infect animals and humans, particularly pathogens affecting food animals and food safety. Read the ARS News article about the three scientists (including Dr. Fayer) honored this year. Click here to go to the ARS Science Hall of Fame (including full list of members). Among this year's ARS scientist and staff awards, EMFSL microbiologist Mónica Santín-Durán was recognized with the 2011 Beltsville Area Award for Early Career Scientist, for conducting outstanding research to discover pathogens of public health concern in food animals. The April 2010 issue of Agricultural Research Magazine highlights subsurface contaminant transport research conducted by Yakov Pachepsky in a partnership with the U.S. Nuclear Regulatory Commission. The September 2009 issue of Agricultural Research Magazine highlights composting research by Patricia Millner as part of an article entitled "In the Eastern United States: A Multifaceted Focus on Farms and Food." Among this year's ARS scientist and staff awards, EMFSL microbiologist Manan Sharma was recognized with the 2009 Beltsville Area Award for Early Career Scientist, for developing innovative methods for detecting internalization of pathogens into leafy greens. The 2009 Beltsville Area Celebration of Excellence was held on September 23, 2009. Work in 'Hyperspectral Imaging for Food Quality and Safety Inspection' coordinated between three ARS locations (MWA, BA, and SAA), including the efforts of BA/EMFSL scientists Kevin Chao, Moon Kim, and Alan Lefcourt, was selected as one the recipients for the 2009 Award for Excellence in Technology Transfer. This award is presented annually by the Federal Laboratory Consortium for Technology Transfer (FLC) to recognize outstanding work in the process of transferring a technology developed by a federal laboratory to the commercial marketplace. Award recipients were recognized at a ceremony on Thursday, May 7, 2009, during the FLC National Meeting in Charlotte, North Carolina. The July 2008 issue of Agricultural Research Magazine featured two articles highlighting EMFSL research: Manan Sharma's work with bacteriophages is described in Bacteriophages as Novel Antimicrobials for Food Safety, and Pat Millner's work with studies of bacteria associated with organic produce is described in Organic vs. Conventional Production - Measuring Microbes on Fresh Produce. Moon Kim and Kevin Chao served as co-chairs for the 2008 Food Processing Automation conference in Providence, Rhode Island, June 28-29, 2008. The conference was sponsored by the American Society of Agricultural and Biological Engineers (ASABE) and immediately preceded its Annual International Meeting, June 29 - July 2, 2008. EMFSL researchers Kevin Chao, Won Jun, Jitu Patel, Chun-Chieh Yang, and graduate student I-Chang Yang, presented their research. At BARC Poster Day 2008, postdoctoral researcher Won Jun received 2nd prize among new BARC scientists and research associates for her poster entitled Portable Hyperspectral Fluorescence Imaging System for Detection of Biofilm on Stainless Steel Coupon. Chinwe Madubata, a Eleanor Roosevelt High School student mentored by Brian Bowker, received 1st prize for the high school division. Yakov Pachpesky was one of seven "Area Senior Research Scientists" honored on February 12, 2008. He was recognized for his research and international leadership in development and application of models in agricultural hydrology to predict crop yields, assess soil and water quality, and forecast fate and transport of manure-borne pathogens. Click here to see the ARS News Article about the "Distinguished Senior Research Scientist of 2007" and the seven Area scientists also honored.